The Holy Nobleborn Prince Igor of Chernigov: The mid-XII Century was for Rus' a grievous time of incessant internecine strife over the Kiev principality between two princely groupings: the Ol'govichi and the Mstislavichi. They were all close relatives, they were all – great-grandsons of Yaroslav the Wise. The Mstislavichi were called such after the name of their father – Saint Mstislav the Great (+ 1132), son of Vladimir Monomakh (from whence their other name: "Monomashichi"). The Ol'govichi were called such after the name of Oleg Svyatoslavich (+ 1115), termed because of his bitter ("gore") fate "Gorislavich". Oleg Gorislavich was the son of the Kiev prince Svyatoslav (+ 1076), – who participated in the year 1072 in the Transfer of the Relics of the holy Passion-Bearers Boris and Gleb (Vide account under 2 May), and who is of note in the history of the Russian Church as the owner of two of the most remarkable theological collections of this time – the "Svyatoslav Izbornik [holy fathers selections] of 1073" and the "Izbornik of 1076". In certain of the old Mesyateslovs (Saint-accounts), even prince Svyatoslav himself was esteemed as a saint of God, but particularly famed were his two grandsons: the Monk Nikola Svyatosha (+ 1143, Comm. 14 October), and Nikola's first-cousin, the son of Oleg Gorislavich – the holy Martyr Prince Igor Ol'govich (+ 1147). The Monk Nikola Svyatosha and Saint Igor Ol'govich represent two different paths of Christian sanctity in Ancient Rus'. The Monk Nikola, having given up the world and princely duties, became a simple monk and died peacefully, having spent nearly forty years at the monastery. Saint Igor, by the will of God involved in the struggle for the Kiev principality, by his deed of martyrdom would redeem the legacy of the sin of princely strife. In the year 1138 the Kiev Great-principality was assumed by Igor's elder brother, Vsevolod Ol'govich (great-grandfather of Saint Michael of Chernigov). Although his rule lasted only but several years and was filled with constant wars, prince Vsevolod considered Kiev as his own dominion to bequeathe [a view partly in conflict with the complex "appanage" system, rotating princes on basis of seniority], and he decided to bequeathe it as an inheritance to his brother Igor. On this he cited the example of prince Vladimir Monomakh and said, almost as if intentionally provoking the Monomashichei: "Vladimir did seat Mstislav, his son, to follow after him in Kiev, and Mstislav – his brother Yaropolk. And herewith I declare: if God should take me, I then after me give Kiev over to my brother Igor'". But opposes the proud. The haughty words of Vsevolod, whom also the Kievans did not much love, became the pretext for inciting enmity against his brother Igor and all the Ol'govichi. "We want not to be in inheritance" – resolved the Kievan "veche" (council). The ill-will and arrogance of the prince evoked in response the ill-will and arrogance of the Kievans: Saint Igor, against his will dragged into the very centre of events, became an innocent victim of the growing hatred. The terrible events unfolded impetuously. 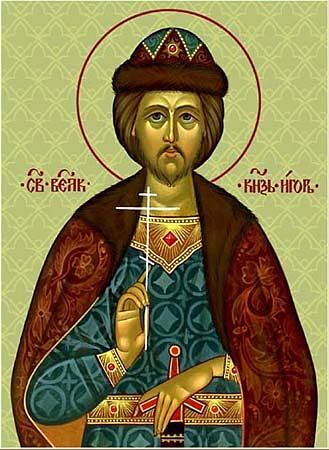 On 1 August 1146 prince Vsevolod died, and the Kievans kissed the cross to Igor as their new prince, and Igor kissed the cross to Kiev – that he would rule the people justly and defend them. But the Kievan boyar-nobles violated their kissing of the cross, and immediately invited the Mstislavichi with their forces. Beneathe Kiev occurred a battle between the forces of Prince Igor and those of Izyaslav Mstislavich. Once again breaking their oath given in kissing the cross, the Kievan forces in the height of battle went over to the side of Izyaslav. For four days Igor Ol'govich hid himself in the marshes about Kiev. Then they took him captive, and took him to Kiev and put him in the "blockhouse". This was on 13 August, and the whole of his time as prince lasted but two weeks. In the "blockhouse" ("porub" – this was a dank log house, without windows or doors; in order for a man to get free, it was necessary to "vyrubit'" ("chop") him out from there), the much-suffering Igor fell grievously ill. They thought that he was dead. Under these conditions the enemies of the prince decided "to chop him out" from imprisonment and have him tonsured a schema-monk at the Kiev Theodorov monastery. With the help of God the prince recovered health and, remaining a monk at the monastery, he spent his time at tears and prayer. The struggle for Kiev continued. Incited by pride and blind hatred, neither one of the sides wanted to give in. Wanting to wipe out the line of the Ol'govichi, and at the same time all its princes, the Kievan veche-council in the following year set about to do away with the prince-monk. The metropolitan and the clergy tried to reason with them and stop them. The prince ruling at Kiev, Izyaslav Mstislavich, and in particular his brother Vladimir, tried to avert this senseless bloodshed, and indeed to save the holy martyr, but they themselves were in danger from the vicious mob. The mob rushed into church during the time of the Holy Liturgy, they grabbed hold of Igor who was praying before the icon of the Mother of God, and they dragged him out to massacre him. Prince Vladimir halted the mob at the gates of the monastery. Igor said to him: "Yoi, brother, wilt thou forsake me?" Vladimir jumped down from his horse, wanting to help, and covered him with his "korzno" (princely cloak) while saying to the Kievans: "Brethren, no murder!". "And Vladimir did lead Igor' to the palace of his mother, and they began to rush forth against Vladimir". Thus reports the chronicle. Vladimir succeeded in pushing Igor into the palace and locking the gates. But the people broke down the gates, and catching sight of Igor "in the lofts" (closed gallery on the second floor in old Kievan garretts), they smashed open the loft, dragging down the holy martyr and murdering him on the lower steps of the stairway. The vicious mob was so intense, that they subjected the dead body of the sufferer to further beatings and abuse, and they dragged him with ropes to his feet to the Desyatina (Tithe) church, and then having thrown him on a cart, they went off with it and "hung him up in the marketplace". Thus did the holy martyr give up his spirit to the Lord, "and he did take off the perishable robe of mankind, and was clothed in the imperishable and much-suffering robe of Christ". When on the evening of the same day the body of Blessed Igor was transferred to the church of Saint Michael, "God did manifest a great sign, and the candles over him were set alight in this church". On the second morning the holy sufferer was buried in the monastery of Saint Simeon, on the outskirts of Kiev. In the year 1150 the Chernigov prince Svyatoslav Ol'govich transferred the relics of his brother, Saint Igor, to Chernigov and put them in the Saviour cathedral. The wonderworking icon of the Mother of God, named the Igorevsk, – before which the martyr prayed before his murder, is located in the Great Uspenie church of the Kievo‑Pechersk Lavra (celebration of the icon is 5 June).